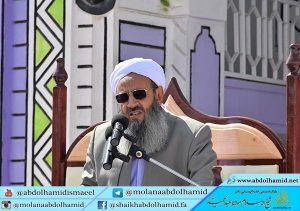 The most influential Iranian Sunni scholar denounced strongly the terrorist attack on Muslim worshipers in New Zealand and called it “savage” and “brutal”. He, in a part of his speech on Friday 15th March, 2019, urged on the government of New Zealand to detain and try all culprits behind the attack. “New Zealand has been located in the neighbor of some countries which claim to be civilized, but we witness such ferocious and barbaric attacks in their countries. Some people commit crimes which cannot be done by rapacious animals,” he added more. “Criminals behind massacring Muslims should be tried and controlled to protect the world from more insecurities and dangers. These criminals are the worst terrorists who martyred Muslims in the mosques. Such savage criminals should be tried and made lessons for others. May Allah increase the stages of the martyrs and put mercy on them,” president of Darululoom Zahedan said. “It has been a long time that Muslims in China had been killed and tortured brutally. The government of China does nothing to stop this process, even its agents are involved in many tortures,” he underlined. “Dividing the province has expenses for the government and as well as for people. Instead of making new governorships and offices, engage this budget in producing jobs,” he added more. “Let this province to remain a big province in the country. Our province has 1000 land borders with Pakistan and Afghanistan and more than 300 maritime borders in the Gulf of Oman/Makran Sea with particular potentials,” he emphasized. “The sides want divide the province should focus on producing jobs and removing unemployment. The people of the provinces which have been divided before are now regretful as there has not been much positive differences for them,” he concluded his points.